If you keep linens stored in your bathroom, then you should put the matching sheets inside the matching pillowcases. This makes for one neat bundle. As for your towels, you might consider hanging small wicker baskets on the wall and then rolling up your towels to put inside. Very organized and very decorative. Magnets can be a big help inside your medicine cabinet. You can glue small round magnets to this inside of the medicine cabinet for your tweezers. You can also use a magnetize strip on the inside door for other metallic items such as scissors and nail clippers. 2-inch pieces of PVC pipe glued to the inside door of your bathroom cabinet makes a great holster for a curling iron. You can also use a 1 1/2 inch piece of PC pipe glued right next to that one for the storage of the electric cord. Very simple. 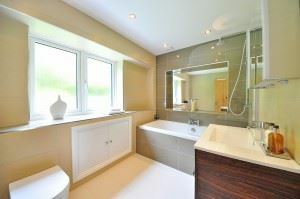 You probably have space above the door in your bathroom. This is a great area to hang a shelf. This becomes the perfect place to store your cleaning supplies or bulk items. A wicker or plastic basket with a handle is a terrific place for all your hair regimen supplies. This can easily be pulled in and out of from under your sink. Having everything in one spot is very productive. Staying organized in the bathroom and throughout the rest of your house also means getting rid of excess clutter. It’s not just old magazines and junk mail that has to be tossed out but the bigger items that are taking up valuable storage space. If you have a closet that’s full of old computers or garage that has stacks of appliances, then you want to bring in Junk King Indianapolis. These are the junk removal pros that make quick work out of removing any unwanted item from your home. All you have to do is point to what you want taken away in the Junk King Indianapolis crew will handle the rest. Getting organized is easy when you work with Junk King Indianapolis to clear out the clutter. This entry was posted in Indianapolis Junk Removal and tagged bathroom organize, clutter, junk King Indianapolis, rubbish on June 30, 2017 by Junk King. Last updated July 1, 2017 .